Physical Description:  p., col. ill., 22 cm. A thoughtful first glimpse into the world of marine mammals--from the small, playful sea otter to the gigantic blue whale. 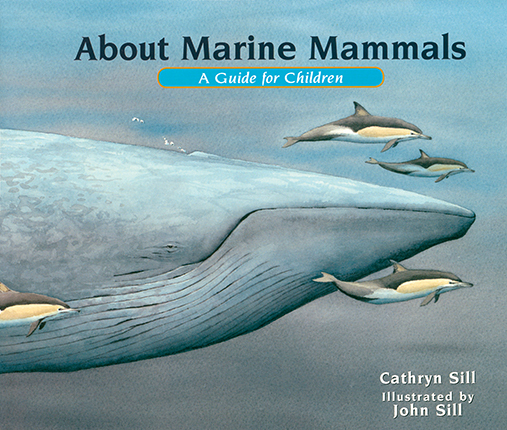 School Library Journal - 07/01/2016 PreS-Gr 1—This broad introduction to marine mammals covers major characteristics, using illustrations rendered in soft hues to captivate readers. Basic ideas about habitat, diet, behavior, and biology are conveyed through simple sentences with a focus on similarities and differences. For instance, the sentence "They [marine mammals] may live in warm tropical water…or in cold polar seas" is accompanied by a large illustration of spinner dolphins in bright water near an island and an image of a polar bear on an iceberg surrounded by darker water. Because the text is fairly general, young readers may not understand how these creatures differ from or stack up against other aquatic life. Educators and caregivers will likely need to preempt or follow up this reading with a bit more context. The two concluding spreads promote a simple but true message on ocean preservation ("It is important to protect marine mammals and the places where they live."). An afterword expands on each species featured and provides a bit more about marine mammals in general. VERDICT A serviceable addition for young children interested in ocean wildlife.—Nancy Call, Santa Cruz Public Libraries, Aptos, CA - Copyright 2016 Publishers Weekly, Library Journal and/or School Library Journal used with permission. Booklist - 07/01/2016 In this, the team of Cathryn and John Sill continue their excellent series of introductory guides for children. The diversity of marine life is spotlighted by brief introductory exposition, full-page watercolors, and a more detailed examination of each included animal or an aspect of its life at the end of the book. The combination of the Early Reading format at the start and the more advanced paragraphs at the back, with supplementary facts and information, broadens the appeal for readers of various levels. The pictures are in a palette of tranquil blues and greens and warm coastal browns, while the breadth of mammal life includes both well-known creatures, such as polar bears and orcas, and lesser-known animals, such as the vaquita, an endangered porpoise feared to be nearly extinct. A glossary, suggestions for further reading, and a list of bibliographic resources used by the creators round off this solid nonfiction treat for budding naturalists. - Copyright 2016 Booklist.